This item has been discountinued. Rejuvena 7000 Facial Care System - NEW and Improved! Absolutely the BEST product on the market for aging skin and wrinkles! 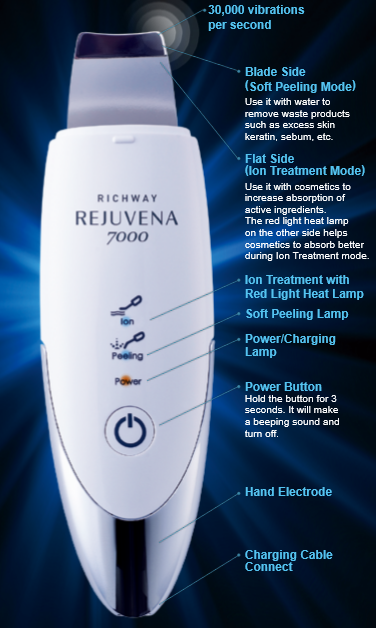 With state-of-the-art technology, Richway developed the Rejuvena 7000 and scientifically created it to respond to the real needs of aging skin. When the skin is unable to exfoliate naturally, the surface of the skin begins to build up old cells, and its appearance becomes dull. Experience the effectiveness of the Ultrasonic, Negative and Positive Ion System in improving skin roughness. Smooth, lustrous skin is revealed gently and naturally. The Rejuvena 7000 generates a wide range of ultrasonic vibrations. The 30,000/vps setting allows nutrition to penetrate deeply into the skin through the Netzschicht layer. The result is healthy and supple skin, better blood circulation, thus removing the appearance of wrinkles. The special effect of the micro-vibrations of ultrasonic massage is the double-effect of a pull and push movement in a vacuum. The micro-vibrations generated by ultrasound massages all the skin cells. When the skin cells are influenced by the micro-vibrations, the waste material and toxins are eliminated from the cells naturally. When the vibrations stop, fresh nutrition is absorbed into the cells to fill the space made by the elimination of waste materials. When this process is repeated, enough hormones are supplied to the skin cells that the cells are reactivated. When Negative Ions are used, it greatly improves blood circulation and penetrates deeply into the derma layer and into the basel cell layer as well. This smooths wrinkles, contracts pores and makes the skin supple. The stimulus of Negative Ions deeply massages face muscles removing deep wrinkles. The Rejuvena 7000 was developed considering various characteristics of the body. So, various effects can be achieved with only one massage. You will begin to see the results of moisturizing and preventing wrinkles with the use of the Ionized Vitamin C Serum. Aged skin will become supple since ultrasonic waves stimulate skin muscles with vertical and centrifugal movements. This process reactivates the aged skin cells, making the skin supple and healthy and beautiful. You will get deeply cleansed skin. The major reason for skin problems is waste material build-up and a reduction of metabolism of the skin cells. Ultrasonic Micro-Vibrations (30,000 vps) penetrates deeply into the skin eliminating waste material and stimulating the metabolism of the skin cells so it will give you healthy and clean skin. Is there any possible way to maintain a youthful look? To satisfy the desire of women who want to keep a youthful look, new technologies to prevent aging have been developed. The cause of wrinkles will be decreased. The skin has a hard time absorbing nutrition. The remarkable effect of the Rejuvena 7000 High Tech Ultrasonic Skin Care System (which was developed considering the above physiological mechanisms) has been proven to reverse the aging process. The Negative Ion mode helps release fat and waste cells deep inside pores. Apply pure O+ (pH 6.5) to the skin. Rejuvena 7000 combining ultrasonic massage to enhance the effectiveness of this advanced technology. Beautiful skin has a supple, soft and silky texture. Over time, the skin becomes dry, rough, and less resilient. Rejuvena 7000’s Ultrasonic System helps encourage the body’s natural beauty rhythms to restore a younger-looking appearance while bringing vitality and smoothness to the skin. Deep cleansing ions delivers nourishment into the skin, using electrical repulsion. The skin begins to build up old and dead cells with waste materials. Negative Ions dramatically enhance your skin’s natural condition and decreases appearance of lines and wrinkles, increases moisturization, for healthier, younger-looking skin, today and tomorrow. Negative Ion massages will give you a soft and supple skin and deep cleansing. Fine wrinkles are a sign that the skin is aging, and also a sign of dry skin. The Rejuvena 7000 system’s negative ions eliminate waste materials and toxins from the skin. Deep cleansing ions delivers nourishment into the skin, using electrical repulsion. The skin begins to build up old & dead cells with waste materials. Negative Ions dramatically enhance your skin’s natural condition. Decreases appearance of lines and wrinkles, increases moisturization, for healthier, younger-looking skin, today and tomorrow. Negative Ion massages will give you a soft and supple skin and deep cleansing. Fine wrinkles are a sign that the skin is aging, and also a sign of dry skin. The Rejuvena 7000 system’s negative ions eliminate waste materials and toxins from the skin. The Ultrasonic scrubber, the most frequently used beauty instrument in dermatologist and beauty clinics, have been too expensive and too big to be use in homes. 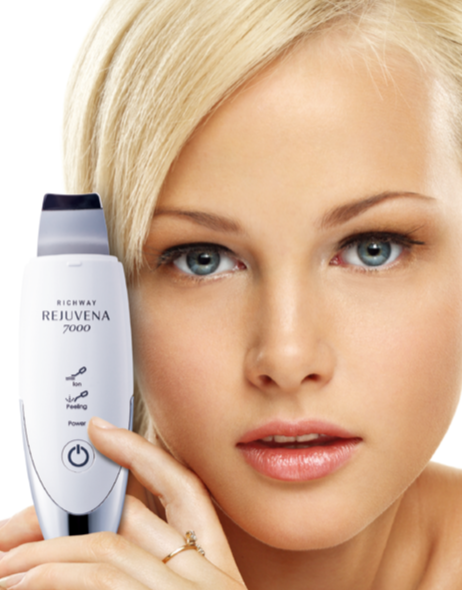 The Rejuvena 7000 is a world level beauty aid instrument. The size of the instrument has been dramatically decreased from the old-style professional models and also the price of our instrument is very affordable. It is easy and convenient for you to use in your home, and, best of all, maintains the same high standards and performance of the instrument used in clinics. The strong ultrasonic vibration that is generated at the tip of the scrubber, causes the acidic water to get mixed with serum, toxic substances, bacteria, cosmetic residue, etc., and then strong vaporization will remove those foreign substances, serum, and etc. Moving direction of the scrubber. Holding the blade facing down will further the efficacy of massage to the hypodermis, activate the cells deep under the skin, and expedite circulation of blood and metabolism. Also it helps to soften the skin and mitigate wrinkles. 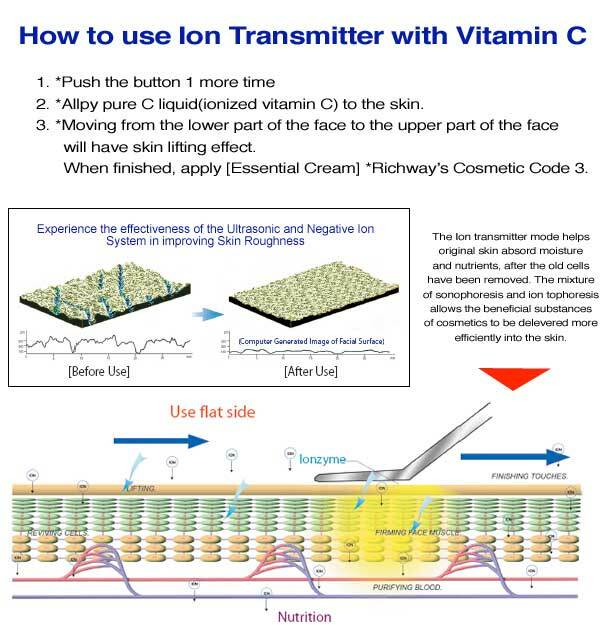 Ion transmitter, a widely used method in the fields of dermatologist, emits feeble electric current to the skin to lower the skin barriers, and uses electrical repulsion to deliver the nutrients of cosmetics to the deeper layers of the skin. Rejuvena 7000 has adopted it for home-care use. By using the "-ion" mode, Vitamin C Serum and ion elements of these cosmetics can more easily permeate into skin, and the "+ion" mode helps permeation of mineral elements into skin.